Although Naim has been making audio gear since 1973, it is not your typical stodgy old-school hi-fi firm. Instead, it is one of those fleet-footed audio manufacturers whose products have continued to evolve over the years. Sure, it still makes separate preamps and power amplifiers as well as DACs (how quaint), but Naim’s latest components are one-box units far less demanding of room acreage. The Uniti Nova ($7495) is Naim’s highest-priced and most feature-laden single-box audio system. Add loudspeakers, and your stereo is almost complete. Throw in a streaming subscription or two, a NAS drive full of music, and the Naim remote control app downloaded to your smartphone, and you’ll be stylin’ au moderne, Naim-style. Is the Uniti Nova the ultimate one-box audiophile solution? Let’s try it on and see how it fits. If forced to describe it concisely, I would call the Naim Uniti Nova “an integrated amplifier for the 21st century.” Input options include one single-ended analog input, one five-pin DIN input, two USB inputs (one on the front and one on the back of the unit), one SD card slot, one HDMI input, one BNC digital input, two coaxial SPDIF digital inputs, two optical TosLink inputs, wireless streaming via Chromecast, Airplay, Bluetooth (AptX HD), or Wi-Fi (2.4 or 5GHz), and UPnP streaming via the Ethernet connection. The Uniti is also a Roon endpoint. FM radio devotees will be happy to learn that Naim plans to release an FM receiver module for the Uniti in the near future. Currently any FM station with an Internet presence can be listened to via the built-in V-Tuner app. LP listeners will note that the Uniti Nova does not have a built-in phonostage or RIAA correction, so you will need an external phono preamplifier to connect your turntable to the Uniti. Audio outputs from the Uniti Nova include one pair of stereo line-level analog RCAs, one analog headphone jack, and one pair of high-power outputs from Uniti’s built-in stereo power amplifier. Unlike many contemporary integrated amplifiers, which have gravitated to Class D power sections, the Uniti uses a more traditional Class AB solid-state amplifier similar to what Naim has used in its NAIT amplifier series. The amplifier section is capable of 80Wpc (the specifications sheet fails to mention whether this is RMS or peak power). In standby mode the amplifier uses less than 5 watts of power, and in something Naim calls “deep sleep” it sips less than 0.5 watts. The Uniti Nova supports all current digital formats including WAV, FLAC, AIFF, ALAC, MP3, AAC, OGG, WMA, and DSD 64 and 128. As of March 2018, the Naim Uniti does not support MQA files. According to Naim’s PR firm, “the (Uniti) platform is technically capable of handling MQA, so adding it is possible. However, Naim is not currently making public any plans to do so.” Digital music files can come from your network-attached drives or streaming sources, or you can attach a USB drive directly to the Uniti Nova via the USB connections on the back or front. Uniti’s USB drive storage has a limit of 20,000 tracks. The digital section of the Uniti Nova is built around a 40-bit SHARC DSP processor that includes a large internal buffer capable of storing “five minutes of data,” according to Naim (but the company does not mention at what sample rate or bit density). 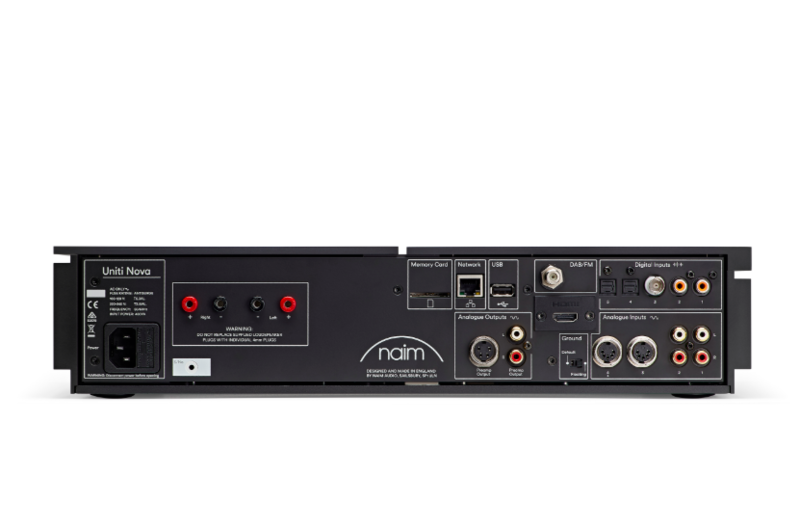 Naim uses 16x oversampling feeding a Burr Brown DAC chip. Naim is especially proud of its illuminated top-mounted volume control. This large circular knob, nearly as broad in circumference as the power amplifier’s toroidal transformer situated directly below it, is a design taken from Naim’s NAC-N 272 streaming preamplifier. The onboard controls, which include a front-mounted full-color screen, offer two ways to run the Uniti Nova. You can use the supplied remote control, which lights up and is large enough so that it is difficult to misplace (but not so large as to require weight training). The second way to control the Uniti Nova is through Naim’s app for smartphones and tablets. I installed the app on both a Sony Experia Android-based tablet and my iPhone 6SE iOS phone with no issues. Looks always matter, despite what anyone else tells you…and the looks of the Naim Uniti Nova are slick and modern yet understated. The textured black chassis contrasts elegantly with the glossy black plexi frame around the color display. The large top-mounted volume control is so cleverly obvious that anyone with even the slightest knowledge of electronics will immediately recognize its intended function. One surprise: The Nova is quite a bit heavier than you might expect, due in large part to the toroidal power transformer for the power amplifier, which occupies nearly one-half of the internal real estate.